Emerson's point seems to be that nature's greatest gift is to enfold humanity within its day to day workings which Emerson sees as its ability to quell humanity's loneliness. Ironically, our control of Earth's ecosystems is rapidly moving us towards isolation from other species with which we share the planet's bounty. From this point of view pastoralism has at its heart the close caring relationship between herders and the grassland herbivores on which their livelihood depends. In the twelfth century, the Chinese Zen master Kakuan Shien produced the pictures, poems, and commentaries we know as the Ten Ox-Herding Pictures. They trace a universally recognizable path of contemplative spirituality, using the metaphor of a young ox-herder looking for his lost ox. According to Addison Hodges Hart, the Ten Ox-Herding Pictures and the teachings of Christ, the Good Shepherd who guides Christians to God, share a common vision. Both show us that authentic spiritual life must begin with an inner transformation of one's self, leading to an outward life that is natural and loving. 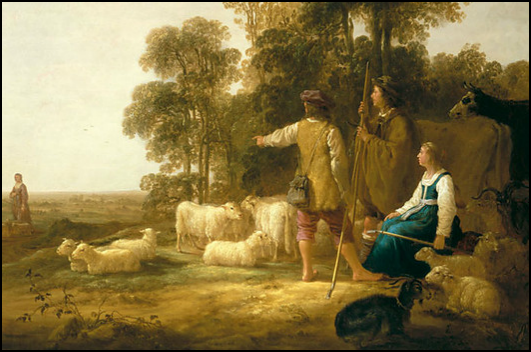 In The Ox-Herder and the Good Shepherd share the story that these pictures and the parable tell to enrich both the Buddhist and the Christian ways. 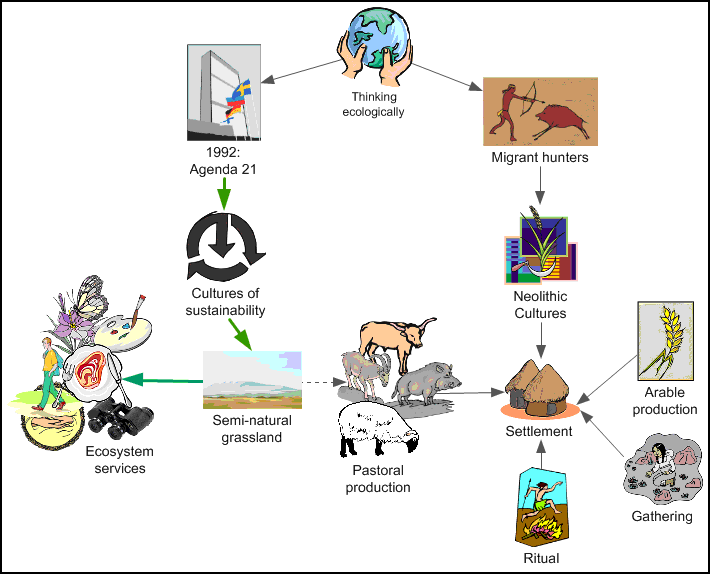 This spiritual perspective on grassland together with the role that herding has played in human social evolution give the study of pastoralism a central role in cultural ecology. The 'grassland' biome is defined as permanent vegetation of herbaceous plant communities. It covers about 25% of the terrestrial Earth surface, approximately equivalent to the area of forest lands or the area of cultivated lands. and (ii) the anthropogenic grasslands, mainly located within temperate climate regions, where woody vegetation is excluded and herbaceous plant communities are maintained by means of human management for domestic herbivore production. Among those anthropogenic grasslands it is also possible to distinguish long-term naturalized grasslands from cultivated grasslands with a wide range of variation in degree of intensification. All these grasslands play an important role in agronomic, economic and social activities in the exploitation of their resources by domestic herbivores for food and fibre production. The efficiency of exploitation of the vegetation resource and its renewal by means of more or less intensified management systems has been the main focus for 'grassland science' within the different regions of the world during the last century. Nowadays, facing the problem of sustainable development, it is necessary also to consider the important role of grassland ecosystems in the dynamics of atmosphere, hydrosphere and continental surface interactions that drive changes and environmental hazards at local, regional and global levels, and also how the functioning of the grassland ecosystems can adjust to these changes. • Provisioning services such as food, drinking water, timber, fibre and fuel. • Regulating services such as climate, floods, diseases, wastes and water quality. • Cultural services such as recreation, aesthetic enjoyment and spiritual fulfilment. • Supporting services such as soil formation and protection, primary production processes, biogeochemical cycles and dynamics of biodiversity - all functions necessary for providing other services. The concept of 'ecosystem services' is encapsulated within the definition of "sustainable development', which argues that the three components - environmental, economic and social - must be analysed together in a deliberately multi-disciplinary approach. This approach identifies the current challenge we have for moving from a traditional historical vision of grasslands used exclusively for domestic herbivore production to a more integrated vision, where all ecosystem services and their multiple interactions have to be considered together.